Victory - Honor God. Make Disciples. | Victory Malate: Flash Forward! You are here: Home / Victory Malate: Flash Forward! 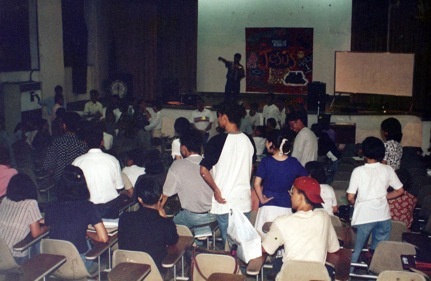 Every Thursday evening in the mid-90s, a small group of students met for fellowship and encouragement, armed with the good news and a passion to reach their classmates and friends in different campuses in Manila. Flash forward to 2011, Victory Malate is now celebrating fifteen years of honoring God and making disciples! Work for Victory Malate first began in 1996, spearheaded by Pastors Jun Escosar and Jonathan Bocobo. The church plant was first called “Victory Taft,” with the intent of reaching the campuses of University of the Philippines – Manila and De La Salle University – Manila. Within the same year, local missions teams were sent out to plant churches in the provinces of Bacolod, Negros Occidental, and Santiago, Isabela. Eventually, their vision of reaching the nations bore fruit, when in 1999 Victory Taft sent out cross-cultural mission trips in Korea and Myanmar. As the years passed, more campuses and universities within the Manila area were being reached with the gospel. Our campus ministry also began their efforts to include high schools in the city. Around the same time, our church plants in Zamboanga, Dumaguete, and Roxas were being supported by short-term missioners from this church plant. In spite of more people being sent out to help, Victory Malate continued to grow in numbers. What started as a small gathering in the UP-Manila Little Theater grew and expanded to various venues to house the growing number of students, families, and single professionals attending their weekly worship services. Victory groups are meeting in different venues in the Manila area. Currently, Victory Malate holds services every Sunday at the Village Square, Harrison Plaza, still reaching out to the campuses, businesses, and families in our nation’s capital city. Come and celebrate with us! We’re having one grand celebration in one servicein one venue on Sunday, November 13, 4 PM, at the PICC! Invite your family and friends to be there! Victory Malate is one of our various locations meeting across Metro Manila. We also meet in different provinces across the country. You can also receive updates on their Facebook account. New Series: Abraham’s School of Finance Victory Tarlac: Going Strong at 20!